marketing plan for your project. Get answers to your hardest questions without sifting through blogs and low-value content. 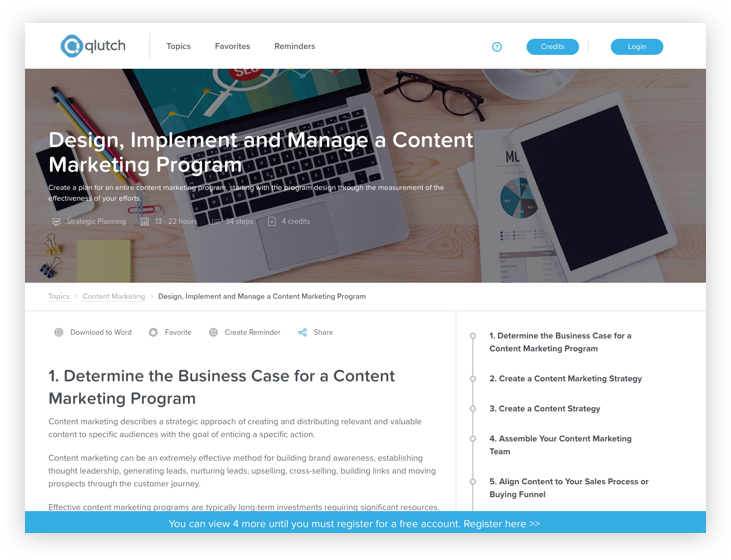 Qlutch is your one-stop shop for how-to guidance for the 400 most common marketing projects. Organized by topic, including the list of tasks, instructions for each step and the estimated project completion time. Stay high level, or dive deep. With over 400 plans, you’re sure to have some favorites. Access them from your Favorites page. Need a friendly reminder to complete a task or plan? Schedule a reminder notice for Outlook, Google, iCal or your project management system. Marketing is a team sport. Share tasks or plans via email or broadcast via LinkedIn, Facebook or Twitter. For long plans like a new product launch, schedule the tasks on your calendar to align your team. Then complete each step of your task. Buy offline credits - for as little as $35 - to download plans to Microsoft Word. Buy a few, or buy a lot and save. Qlutch is free to use. Access plans, share and set reminders. © 2018 Qlutch Marketing, Inc. All Rights Reserved. 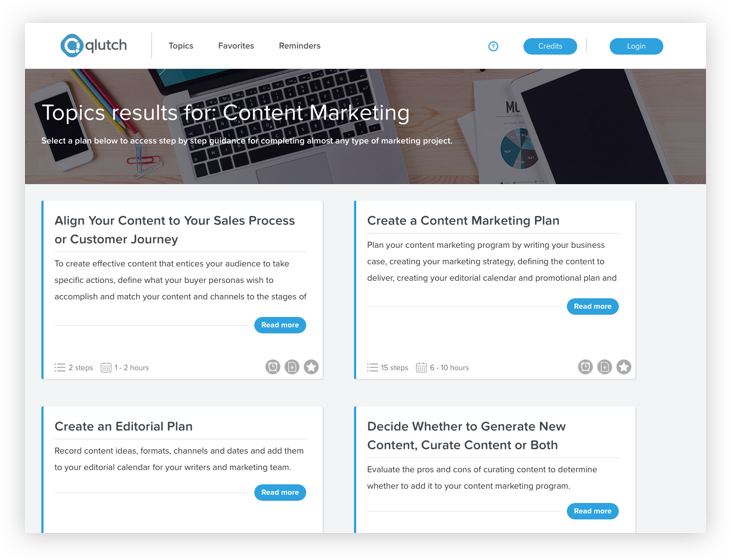 Qlutch is your one-stop shop for how-to guidance for the 400 most common marketing projects. Free to use online.